Fun Fake News: Tracy Morgan’s Tell-All Book: Tina Fey’s feet smell like feet! 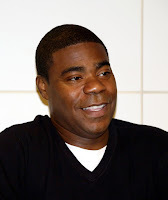 “I’m not the least bit gun shy when it comes to unloading all the dirty laundry of my fellow former SNL cast members,”’ said Tracy Morgan on his recent promotional tour for his book '‘I Am the New Black'’ about his rise from the mean streets of New York City to an Emmy Award nominated actor in Hollywood for his performance on "30 Rock’'. In which some argue he pretty much continues to play himself. In his new tell-all book, which comes with a special introduction by Maya Angelou in which she dedicates a new poem to him entitled: ‘I Fall’; Tracy Morgan begins his sortie claiming Tina Fey of all things has a chronic foot odor problem. Tracy Morgan writes that during SNL read-throughs, Tina Fey would often kickoff her stiletto heels. Only for him to threaten Lorne Michaels that he would walkout, if he did not get her to put her shoes back on. Morgan goes on to profess his love for Tina Fey as well, especially for writing him a permanent role on ‘30 Rock’ as the other adorable self-centered insensitive stereotypical male chauvinist pig, opposite Alec Baldwin’s character. Later, Tracy Morgan prided himself on curing Tina Fey’s alleged foot odor problem on the set of ’30 Rock’ at least temporarily, claiming the condition is a lot like the hiccups. Wearing a black ski mask and carrying a rubber knife he barrowed from the prop department, Tracy Morgan hid behind Tina Fey’s car, waiting for her to come down stairs. And when she did, he jumped up behind her, causing her to faint. Tracy Morgan’s tell-all book is not just about the shortcomings of his fellow 'Not Ready for Primetime Players', however. He takes a few chapters to remove the rafter from his own eye as well. While on SNL, Morgan enjoyed dressing up like Maya Angelou. After that, Tracy Morgan was always made to feel as if he was invisible by some of his fellow SNL cast members. Tracy Morgan says that he did not mind his fellow SNL cast members knowing that he had the power of invisibility, only that they used it against him. Tracy Morgan’s book would be incomplete if he did not have a few words to say about his mentor, Lorne Michaels.